Those of us who are looking to get the wonderful benefits of having a FAR infrared sauna in our own home, have probably come across the various options, including this and other models from JNH Lifestyles. Seemingly, with it's overwhelmingly positive customer feedback, the 2 person model is their most successful product so far. We want to look into the product a little more closely to determine if in fact it's a worthy investment, or there's simply a lot of hype surrounding this product, as there is generally around the whole current popular “health fad” of FAR infrared. Are There Any Problems With This 2 Person FAR Infrared Sauna Model? This 2 person sauna from JNH Lifestyles is a serious “bit of kit”, and you'll want to make sure you do your research into the product, and exactly what you're getting before you finally take the plunge. That being said, it's probably one of the best options for those looking to setup their own personal FAR infrared sauna setup in their own home (or office) due simply to it's good range of features, excellent quality materials, and sturdy build. Whether you're looking for a FAR infrared unit that uses environmentally safe, and non toxic materials for it's construction, or you're looking for a unit which features excellent built in control options internally allowing you to control the temperature and timer settings, then the JNH Lifestyles 2 Person FAR Infrared Sauna is a great option. It's also well priced for what you get, and even comes with good quality in built speakers and a AUX input so you can basically play music from any source you want, whether it be from your smart phone, MP3 device or something similar to an “old school” CD player or the like, this sauna will allow you to hook that up, which means a great added bonus in being able to listen to your favorite relaxing tunes or meditation tracks to help you get into the mood even more completely. Easy construction is also a big plus for this model, and one of the reasons it's been so popular among people looking to take the leap and get their own FAR infrared unit. Some of the smaller, yet very similar models of JNH Lifestyles saunas only included 5 carbon fiber FAR infrared heaters, whereas this model includes 7. This is said to be the latest in FAR infrared technology at the time of writing. These heating units are positioned to each side and the rear of the seating bench, as well as below the bench where your calf muscles are situated, which means users get a nice consistent heating effect from all angles except the front where the door is positioned. 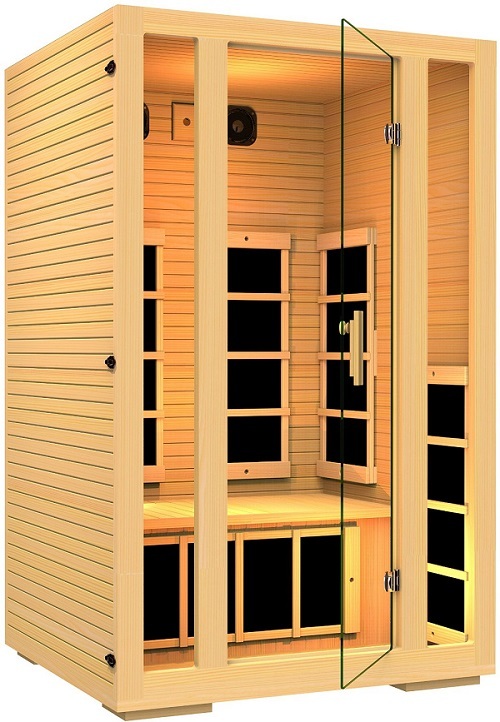 This unit is made from “100% top quality” Canadian Hemlock wood, and is the so called “Green Wood” which means no chemicals are used during the treatment or curing of the wood, which is important as such chemicals would likely find their way into the close area around the sauna if this was not the case. There is also no plywood or cheaper woods used in the construction of this sauna unit. It's also approved with the FSC's (Forest Stewardship Council) forest management certification, which means that the woods are grown in an ethically sustainable manner. If you're interested, you can read more about that particular aspect of the material used for this unit by reading here. The unit also comes with 2 premium built in speakers, which along with an included standard 3.5 AUX jack, allow you to listen to your music via almost any source. The 3.5 AUX jack is a pretty standard adapter, and is what's used for all headphone jacks on most devices on the market. This means that you can easily plug in your smart phone, or MP3 player or in fact any audio source, as long as you get it connected to this specific jack input (which can easily be achieved by using a conversion adapter, if you're specific audio source doesn't plug right in. If you're a potential buyer concerned about what might happen if you get any issues with your JNH Lifestyles sauna, then you'll be glad to know that this unit like all other products from this manufacturer comes with a 5 year standard warranty. Not only that, but one of the things we noticed from doing a lot of research on the product, and reading into the customer feedback and reviews, is that the customer feedback referred many times to the excellent customer service provided by JNH Lifestyles. The feedback for this particular model from JNH Lifestyles is overwhelmingly positive, and this is probably one of the biggest reasons for the product's growing popularity and its position as one of the most saught after 2 person FAR infrared sauna units available at this price point. As of the time of writing, just on Amazon.com alone, and not including the other Amazon store sites (Amazon UK, DE, etc) or the JNH Lifestyles websites either, there's nearly 1000 total reviews for this particular model, which averages out to provide this model with a 4.5/5 star rating. There's also a lot of customer feedback regarding the many questions which have been asked about the unit, and one easily gets the impression that MOST of the people who bought this unit were big fans, and wanted to express that to others who were still on the fence and asking questions about the products worthiness in terms of their next purchase. Probably the main issues that people commented on regarding this particular model were related to the additional costs of certain extras (like the specific bulb pictured here), and also the poor quality instructions for putting the unit together upon delivery. For example regarding the additional extras, there is a chromotherapy light which you can apparently only get directly from JNH Lifestyles, otherwise it won't work with the particular fitting inside the sauna. This annoyed people somewhat, as they found that had the light bulb fitting been more flexible, then they would have been able to source a similar coloured bulb for a much cheaper cost. The other main issue may not be a problem now, as JNH have provided a video like the one below LINK TO VIDEO, which specifically details information about how to put together the sauna unit after delivery. As with the purchase of virtually any product online, you generally have a vast array of options available. That being said, your purchase will invariably be affected by a couple of main points of service. Firstly, is the site you are dealing with able to get it to your location, are you able to source it where you live? The second really important issue with buying online, is making sure that you're purchase is secure and safe, as many of the smaller sites can be more vulnerable to credit fraud viruses, etc. This is something you really need to be wary of. Both of these reasons make an excellent case for purchasing your sauna online via Amazon. They are one of the largest websites in the world of course, and THE largest eCommerce website, which means they have great customer service, and you can be rest assured of a safe purchase online, going through their shopping cart. Here's some common questions which we sourced in order to make your buying decision easier. Some of these are directly from Amazon.com, others have been sourced elsewhere. We've tried to make the questions and answers here as useful as possible, because you'll find that sometimes the source can be highly repetitive and you'll be reading over the same questions and answers multiple times. How hard is this model to setup/install? What size is this 2 person Sauna? Can this sauna be setup outside? The instructions say that it should only be setup indoors. However there MAY be situations where you can use your better judgement and make exceptions. If you had a very well sheltered veranda for example, this may work, but be aware that by going against the instructions in such cases, you may end up voiding the warranty. Another issue that you need to be aware of if you're even considering this, is that not only do you need to keep the Sauna protected from the elements (wind, water, etc) but HUMIDITY is another issue which will cause damage to the unit and may make it unsafe to use. Basically, it's not advisable to set the unit up outside. Can it be setup on carpet instead of a hard floor? It seems that other customers have done this no problem, and when you consider the fact that it's infrared, then it makes sense that there should be no problems setting it up on carpet. All the heating is done internally within the heater and it's infrared, so the outside of the unit doesn't heat up. Are there any exposed wires on this sauna unit? No, there are no exposed cables or wires, the cables run inside the walls from the different heaters to a cable box, which is positioned underneath the seating bench. What are the audio options that integrate with this JNH Sauna? It comes with speakers and an audio jack, so basically you can use any audio source you like, whether that be a smart phone, MP3 player or CD player or other. Does this model come with a Chromotherapy Light? It does not, but they are available also from JNH Lifestyles, here's an example on their website. Would this Sauna be able to be setup on a platform for use in a basement for example? It seems that this could be done, the main concern is to keep the unit completely flat and it's weight very well supported to avoid any issues. In which area does the power chord exit the unit's main compartment? It comes out of the back wall of the unit, on the lower left. What about storing the unit in a colder climate? Similarly to trying to set the unit up outside, you will be at risk of voiding your warranty if the conditions where you are setting up the unit are not within it's intended usage. You need to be aware that the sauna unit cannot be exposed to precipitation, so temperature does play some role. Obviously, if you decided to do this, it's going to take longer to heat up the interior of the unit too. That being said, for questions like this, it's always best to contact the manufacturer directly to ask them. All the contacts for JNH lifestyles can be found here. For someone who wants to set this up on a 2nd story floor, would that be problematic? It's unlikely, as the total unit weight is 250 lbs, or approximately 113 KG. Could a TV be connected to the unit's speaker system? 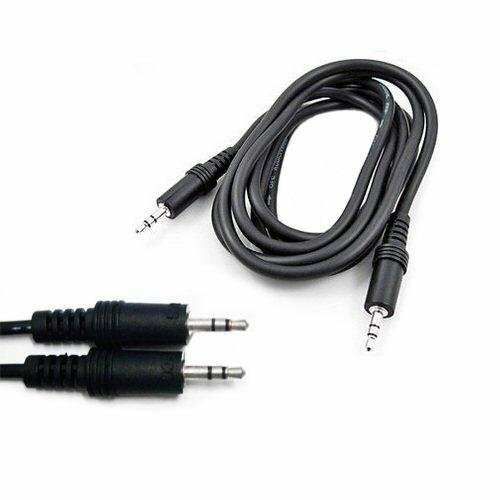 Any audio source will work AS LONG AS it uses a 3.5mm jack, which is the typical headphone jack cable input size. How hot does this sauna get? This model can reach internal temperatures of 100-140 degrees Fahrenheit (which is 37-60 degrees Celsius). Does this sauna have a programming feature to time my sessions? Not really, you can set the timer to a certain amount of minutes, so you can set it to be ready by the time you need to use it, but you cannot set it to start at certain times of the week for example. However, there MAY be a work around if you looked into time programmable power switches. What sort of power outlet does this plug into? This will plug into your standard household power outlet. If you live in a country where you're not sure if it will be compatible, then the best option is to contact the manufacturer directly. How heavy is this on the power consumption? Obviously it's going to depend on how often you are using the unit, but some feedback from customers who bought this model noted that they have not noticed any obvious increases in their electricity bills. Does the wood used for the unit's construction have any kind of bad odor? From what customers have said, they have not noticed any particular bad smells from the unit, which is made of western hemlock wood. Is it possible to get extras like the oxygen ionizer or the foot warmer included with my purchase of this model sauna? For an extra cost, if you contact JNH lifestyles directly you can order these extras along with the purchase of your sauna unit. Would it be a problem to install this sauna in a bathroom area? This may be an issue due to the fact that condensation and precipitation may cause problems for the unit. It's probably not advisable, but if you really wanted to do it, then it would be a good idea to contact the manufacturer directly first. Is it possible to integrate”near infrared” lamps or LEDs into this unit? Some customers have said that they have successfully integrated LEDs into the sauna unit, so it seems it's possible. However you would have to be careful with any type of “modifications” such as this, as you might be at risk of voiding the warranty. Again, contacting the manufacturer is the best option before proceeding with something like this. What are the internal dimensions of this sauna? Does this unit include any steam heating functionality? No, it's purely FAR infrared. What are the dimensions of the bench inside the sauna? If used in a basement space or other area with limited airflow, will this unit create humidity? No, as all the heating is done internally and self contained, and also the heating source is FAR infrared, which has no associated water vapor. Does the shipped product look exactly the same as it does in the product images? Yes, and this is verified by many other customers who have received the unit. Their is some confusion as to whether the current version of the product sold has a wooden or glassed door, which one is it? The confusion is based on slightly different releases of the product. Depending on where you are buying your unit, if you want to be really sure, then call the seller directly and/or call JNH lifestyles directly too, to make sure. Will the unit placed on a high quality wooden floor, damage the flooring? No, because the unit doesn't heat up at all on the outside, all the heat is created and maintained internally. Will this work with UK household power outlets? It should, but call the manufacturer for direct verification to be sure. The only thing that you might have to be aware of, is that you'll require some kind of power adapter, so that you can plug the unit into the wall without any issues. How complicated is it to set up the wiring on assembly? Most people report that it's extremely easy, as it's just a matter of plugging the cables from the heating unit themselves into the cable box. The cable box then simply plugs directly into the wall. How long will it generally take to complete the assembly? Users seem to report that it took somewhere between 60-90 minutes to assemble the unit in general. Though some customers were able to assemble it in around 30 minutes. Pretty much all customers report that the assembly process was very easy. It's something that you'll want to check with the manufacturer on, as it's another area where you may be at risk of voiding the warranty. There's also the safety aspect, and while it's unlikely that adding a layer of paint would create any health risks, it's best to be in touch with the manufacturer to be 100% sure. If one of the heating panels breaks down, is it covered by the warranty? Yes, as long as it's within the 5 year warranty period, then you're covered. Can I run a humidifier inside the unit? No, this would ruin the wood of the sauna unit, as it's not designed to handle moisture, being FAR infrared. Will this kind of sauna help me with weight loss? It's impossible to claim that using a FAR infrared sauna will help anyone lose weight. That being said there's loads of anecdotal reports of such cases. As for this product itself being used for such a purpose, again it would be silly to believe in any universal claims, but that being said, there's lots of customers who've reported that they've seen some weight loss benefits after using this product. How does this sauna compare to the Dynamic Sauna? The Dynamic brand, have similar products, such as this one shown here on Amazon. These are said to be similar in quality and features, with the Dynamic appearing to have larger heating pads and inbuilt chromotherapy lighting. That being said, it's no where near as popular as the model from JNH lifestyles. How does this product come when shipped? The unit usually comes in 3 separate boxes shipped on a palette. Everything will be tightly shrink wrapped. What about the light for this unit? the one from JNH seems overly expensive. The light bulb is said to be a 12 volt bulb, and SOME customers have mentioned success in finding a cheaper alternative apart from the JNH Lifestyles version. You might have to do some digging though to find the right bulb. What is the required voltage and amp draw? The minimum required is a 110 volt, 15 amp outlet. Can I plug my phone or audio device directly into the input? You can, but it's a good idea to get a lengthening cable, so that you can run the cable to the outside of the unit and plug your phone or other device in there. This is because the interior of the sauna gets very hot, and you may be risking damage to your device. Do I really have to unplug the sauna from my power outlet after every use? It's recommended as a safety precaution, however one work around that some customers have discussed is using a power board or similar, so that you can you keep the sauna plugged in, yet power it off of the mains, via a master switch which many power boards and adapters include. Can I put this sauna in a spare room? Yes of course, you can put this sauna unit basically anywhere in your house, as long as it's not outside (some people have said this is fine, but you may risk voiding the warranty if you do so). Are the effects of using this sauna the same as a “real sauna”? In terms of the noticeable effects, yes, you will start sweating generally within 2-3 minutes of using the sauna provided that it's been preheated. In terms of long term health benefits, FAR infrared has been shown to have greater benefits than the traditional form of saunas. More on this coming soon, as we're going to add a research based article on the benefits of FAR infrared to this website. Is this unit big enough to fit an large sized male and average sized female? This unit should have no problem fitting to average sized users. Taller men have reported that there's still 2-3 feet of space above them when seated on the bench. What is the maximum temperature that this sauna will heat to? The max temperature is 140 degrees fahrenheit, or 60 degrees celsius. Does this unit require any extra ventilation? There are 2 air vents built into the unit, one on the bottom and one on the top of the unit. This should be adequate. The unit weighs 250 pounds, so is fairly heavy and you'll definitely need at least a couple of people to move it. It's been recommended by other customers in a similar situation to make sure you put it back on moving palette, to prevent it from being damaged during the move. Is it possible to get back rests to use with this sauna unit? Yes, other customers have stated that these backrests work well, and make the sauna far more comfortable. JNH Lifestyles also have some available here. If I need to get this up or down stairs before assembly, will this be a problem? It should be fine, as the unit comes un-assembled in 3 long separate boxes. Also other customers have commented that they were able to get it up stairs and around stairwell bends without too many problems. Is it possible to upgrade the speakers? Yes it's possible, although from the user feedback it would seem that the inbuilt speakers are of decent quality, and it may not be worthwhile. It will probably depend on how much you are using the sauna, and how much of a stickler you are for extremely high quality sound. Is it possible to lie down in this sauna? No, there's not enough room to lie down, it's really not designed for that kind of use. Where is this unit manufactured? This was a little hard to find out. Amazon state that it's made in China, although JNH Lifestyles themselves are an Australian company. Other customers have commented that it's manufactured as a whole in Canada, whilst the parts may indeed be made in China. So from this, all we can really say is that it's most likely that the actual parts that make up the sauna are mostly manufactured in China, and it seems that it may be constructed and/or packaged ready for shipping in either Canada or Australia. If I'm going to be using a longer AUX cable, where should I run the cable, so it can go from the inside to the outside? Other customers who've done this have suggested that the best place to run the cable is from the front door. I would assume that it fits underneath the door, whilst not interfering too much with the Sauna's ability to seal properly. Although it's obviously meant for 2 person use, is it really that comfortable with 2 people inside at the same time? Yes, it's designed for this very reason, and all customers who've commented on this say that the unit is indeed very comfortable for 2 people. Also with the ability to add S shaped back rests, you have another option to make the unit more comfortable. I don't think this model from JNH Lifestyles would really be described as “portable” as it's very large and fairly heavy, and whilst not difficult to setup, it's not something you'd want to do on a regular basis. That being said, it is of course possible to move the unit if required. Is it possible to swap out the panels in this model to use zero EMF (electromagnetic field/frequency) panels instead of the ones that come standard? Yes it's possible. One customer has stated they were able to do this, and fairly cheaply compared to other options. The best approach if you're wanting to do something similar would be to contact JNH Lifestyles directly. Is it possible to get skin reactions from using this sauna? No one else has reported that problem using this specific model (there's nothing in the customer feedback). It may be possible if you have very sensitive skin. In this case it's always best to get the advice of a medical professional (such as a dermatologist in this case) before you proceed any further. Would it be possible for 1 person to lay down in the sauna with feet up? It's going to depend on how tall you are of course. Some shorter users (around 5 feet, 4 inches tall) have reported that they were able to just lie down on the bench with their feet up. It's unlikely this is going to be very comfortable though, as it's really not designed for this purpose. There seems to be an issue getting the light to work, why would this be? Some users have reported this. It tends to be because they are trying to use a light bulb other than the one that JNH Lifestyles have recommended as compatible with this particular model. I recommend you check out the intended chromotherapy light here (although you may be able to source the light elsewhere). Does this sauna require a drain? No, as it's FAR infrared there is no water or moisture used in the process, so no drain is needed. Does this unit smell after usage? No one has reported this, however I guess it's possible if you are an extremely sweaty individual. How does this impact electricity usage/bills? It seems from other's feedback that the impacts on electricity bills from using the JNH Lifestyles 2 person sauna are pretty small. One particular user who was using the unit quite a lot each week (about 4-5 sessions of 45-50 minutes each) reported that their electricity bill had gone up by around $3-4 USD. Other users commented “not much at all, maybe $15”, so maybe you're looking at $10-15 on average each power bill, depending on how often you are billed and other specifics. So considering how much this person was using it, that's a really small addition to their overall bill. I'm trying to decide between a hot tub and a sauna like this one, which is going to be more beneficial healthwise? FAR infrared has a lot of health benefits, with more studies being released all the time. Here's a few of the published studies found on pubmed, and obviously you can browse for more if you're interested. So that being said, the health benefits of a FAR infrared sauna such as this 2 person from JNH Lifestyles is likely to benefit your health much more than a hot tub. Some of the reported health benefits via the customer feedback and reviews from people who have bought this sauna include reduced inflammation, weight loss, relief from pain caused by Fibromyalgia and arthritis, and of course detoxification. It's also just very relaxing for most people, and some people report that their sleep has additionally improved as a result of using FAR infrared therapy. For someone who really likes to get a heavy sweat on, will this sauna be able to accommodate? Other users report that by using the Sauna at it's maximum temperature setting (140 degrees Fahrenheit), you'll be able to easily generate a really good sweat within 10-15 minutes. But obviously this is a highly personalized question and therefore the answer will really depend on your specific body type and how you personally respond to FAR infrared. What is meant by “Green Wood”? It refers to wood that is Forest Stewardship Council (FSC) Certified. 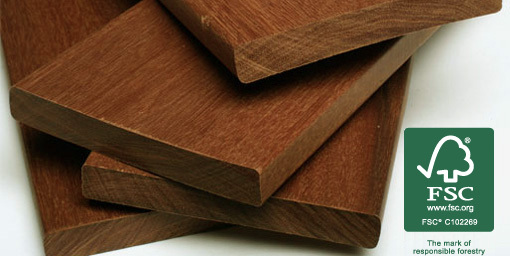 NO chemicals are used/added in the preparation of this type of wood. What are the dimensions of the seat/bench? Approximately 45 inches wide x 19 inches deep. Would it be possible to add padding to the seat/bench of this unit? It would be possible, you will have around 3 inches of space to work with. Instead of going to the hassle of padding the seat specifically, another simpler option is to simply use a folded towel for support each time you use the unit. This also has the advantage that it won't be troublesome to clean (as you will be sweating directly into the towel or padding). Does this particular sauna integrate with the use of an Ionizer? Yes it does, and the input is all ready to go, you just have to purchase it at an additional cost as it's not included and is an extra. Here is the one that JNH Lifestyles supply. What if I need to replace a heater board or other similar part? Yes indeed it's possible. Best thing is to contact JNH Lifestyles directly. How hard is this unit to keep clean, free of mould etc? It's very low maintenance, as there's no moisture, which removes the need for a lot of cleaning and maintenance over time. Simply wiping any sweat away with a dry towel, and maybe the occasional sanitary wipe down if you have multiple people using it would be sufficient. 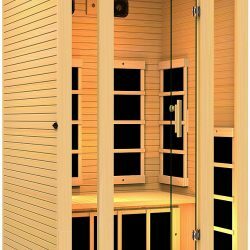 How does this 2 person sauna from JNH Lifestyles compared to Sunlighten and Spiritual Quest saunas? This sauna is simpler and a lot less expensive than some of the other options. Sunlighten saunas for example feature a lot more options, and therefore you pay for the cost of that. What are the infrared wavelength ranges in microns? According to the one of the sellers on Amazon.com, the answer to this is 2 – 3 mG, at 4 inches away from the heater units. Does this unit come with a standard U.S. power plug? Yes, it comes standard and ready to “plug and go” as soon as you've put it together. As far as the power specs are concerned, it's 120 volt with 20 amp. Can one person position themselves sitting sideways on the bench, and if so will the heaters burn the skin? Yes, users have reported this can work well. You will want to have some kind of back rest so that it protects your skin from directly touching the heater units. A folded towel may also do the trick. The unit includes 7 carbon fiber FAR infrared heaters. Is there a smaller model from JNH Lifestyles with similar features? Yes, they have a 1 person version of this Sauna, you can see it here. Is there a NON EMF version of this model? Yes, there is indeed! You can find it listed here on Amazon. Is there a maximum weight for users of this sauna? Can I use aromatics (essential oils like eucalyptus, etc) with this sauna? It shouldn't be a problem. You could use a method like infusing some essential oil in a small bowl of boiled water so as to release the scent throughout the sauna unit. Are there specific options for what you're trying to achieve with the sauna? Not specifically, it's not like with some saunas how they have preset modes for specific applications such as detox, weight loss, etc. But some users have reported that by selecting certain temperature ranges, such as the following, you will be able to access various applications. The validity of this information is not verified, but it wouldn't be hard to do some research into temperature ranges and their various applications when being used with FAR infrared. If I wanted to watch TV from within the sauna unit, could I still hear it through the screen/door? All users who commented on this, stated that it was perfectly fine and possible to hear the audio of their TV through the door. Users also stated that it was possible to carry on conversation with others in the same room, whilst inside the sauna. How wide is the door exactly? Does the Dynamic Canadian Hemlock Backrest fit this model? Yes, from all user reports, this fits with no problem. Can front panel be switched so that the door opens from the right? There is tape holding some of the electrical parts to the back of the heating panels, should I remove this? It's better to leave the tape there, as it's placed to prevent the electricals from getting stretched and disconnected. Apart from the optional chromotherapy light that one can buy separately, is there any other internal lighting in the unit? Yes, there are LED lights inside, next to the control panel. Conclusion – Is The JNH Lifestyles 2 Person FAR Infrared Sauna Really Worth The Price? The 2 Person FAR Infrared Sauna from JNH lifestyles is clearly a solid option for those looking to have their own FAR infrared unit within the home or office. User feedback is overwhelmingly positive on this product, and it's easily one of the top options for a 2 person sauna unit, perfect for couples or just singles who want to be able to include their friends for a relaxing and healing FAR infrared session. The ease of construction make this a solid option for those consumers who are concerned about being able to put together their unit with ease on delivery. It's competitively priced, and you'll probably not find a similar unit with as many quality parts and features as the JNH 2 person for the investment. It's well made, with good construction materials and a simplicity in terms of putting it together (parts mostly just “snap together”) for the first time, which was a pleasing aspect for many customers. As are it's quality build materials and non toxic choice of wood. So overall, we feel that it's an excellent choice for those wanting to start getting all the benefits of having their own FAR infrared sauna close by, and getting the regular use that this allows. Product Description: A great sauna perfect for those looking for a cheaper range FAR infrared to have in the home. This review & rating is independent from Amazon.com's reviews & ratings.